We are excited to present a new format for our favorite art workshops. The new Custom Crave events offer individually crafted workshops that are specifically tailored to your organization’s unique needs. Each workshop has diverse benefits, from encouraging experimentation and building teamwork to problem solving playfully and inspiring mindfulness. Contact us for details. Stuck in a rut? Shibori is perfect for those who tend to get “creatively” paralyzed. The process embraces the unknown. Students start with the same techniques, but the results are susceptible to indigo’s own will. Shibori is a wonderful practice for letting go, for embarking on a journey without knowing the answer, and for trusting creative instincts rather than over-thinking perfect solutions. Shibori is a Japanese technique of binding, stitching, and clamping fabric to create patterns when indigo dye is applied. The transformation of cloth dipped in indigo suggests a potency recognized by craftspeople all over the world. When these two techniques are combined, the results are some of the most immediate and creative textiles imaginable. Marbling is a process where happy accidents create the best works of art. It's a "no fail" method where anyone can participate and make something beautiful. Like their makers, no two pieces are alike. This workshop promotes spontaneity and builds creative self esteem with a little bit of paint and a little bit of magic. Marbling involves paint that is floated and manipulated on the surface of thickened water. By swirling the paint, students create a mesmerizing design that’s then transferred to paper as a permanent print. After spending time exploring colors and patterns, participants will try the technique on their own set of napkins. Our silkscreen class is a team building course where participants help each other create custom art. Each layer is built as a team, while individuals learn from each other’s unique approach. Silkscreen is a great tool for those who love to mix and match and play together. This workshop offers a quick method of silkscreen printing. Participants create their own screen-printed art using images and materials supplied to create prints. The screen will be prepared with bold patterns, but students can also cut their own stencils. We will explore color, pattern and creating expressionist monoprints. Sometimes the act of simple repetition becomes the most powerful tool for reflection. Our Block Printing workshop builds mindfulness through a meditative art practice. Printing each block one by one builds patience and practice for slowing down. Participants are rewarded with a complex product that showcases their careful process. It’s an infinitely creative piece made from the simplest of building blocks. Block printing is one of the most ancient types of printmaking and is an excellent way to make something truly by hand. In this hands-on class, participants turn our blocks into unique patterns. Each student will leave with their own hand-printed fabric pillow. The art of business is being creative with what is given. This workshop inspires coming up with unique solutions with a standard set of tools. It showcases individuals’ unique approaches to similar beginnings, where ten different people will have ten different solutions. Diversity is encouraged and required. We will teach about the art of stencils and pattern mixing. In this workshop, participants learn Katazame, a historic stenciling technique that creates works with bold, geometric designs. 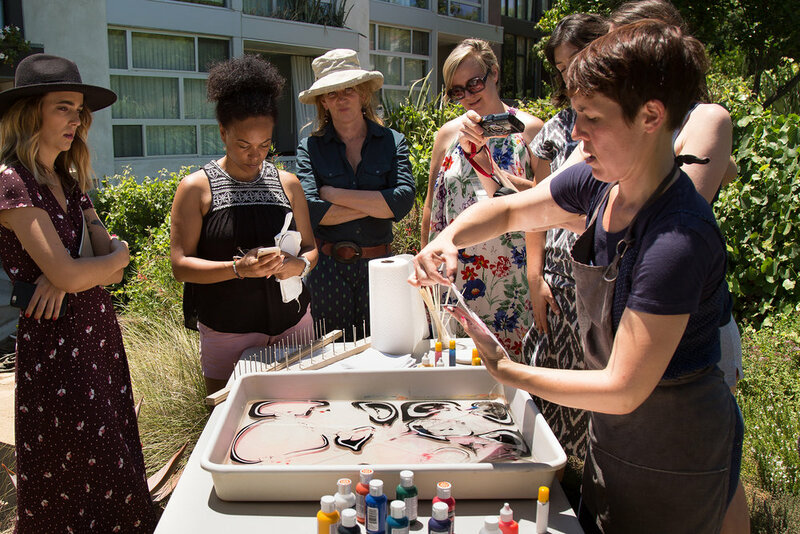 Participants will mix a natural bran paste, paint on the stencils and then use indigo dye to create custom printed textiles. Students will leave with two patterned textiles and an appreciation for the global indigo craft. What a great way to spend a Saturday! Good food, interesting crowd, a short (and fun) lecture, and then we jumped right into dying and literally got our hands dirty. Every print was different and each work seemed to be not only a symphony in shades of indigo and white but also a Roschach Test to glimpse each other’s creative depth. Plus we got some unique pillow covers and towels out of it, that were simply to dye for - pun intended.